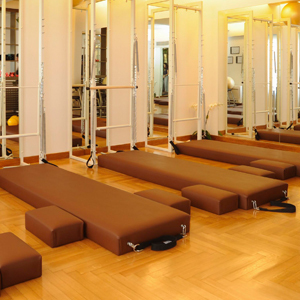 Studio Pilates Alma opened it’s doors back in November of 2009, by Rocío Carrasco Fonseca and Polly Foka. Based at the heart of Kolonaki, in elegant space both well lit and easy on the eye, it consists the ideal atmosphere for working out whether in a group or individually. Alma is derived from the greek word which signifies leaps and bounds and the Spanish for soul, encapsulating the dedication to contemporary learning of the Pilates method in Greece. Joseph Pilates called his method Contrology, because in his method the mind is used to control the muscles. The program focuses on the core postural muscles which will keep the body balanced, will strengthen the deep torso muscles and teach awareness of breath and alignment of the spine. Signup to Alma newsletter to recieve information on upcoming offers, events and information concerning Pilates.